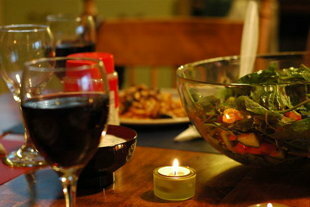 Wine is many things: a nice way to relax, something to share with friends, a perfect complement to a well-cooked meal. But what you don't often hear is that wine can also be part of a healthy diet. A study published in the Archives of Internal Medicine found that "Compared with nondrinkers, initially normal-weight women who consumed a light to moderate amount of alcohol gained less weight and had a lower risk of becoming overweight and/or obese during 12.9 years of follow-up." This particular study seems to point to women having the ability to balance wine with food appropriately.